The U.S. tax reform measure signifies the importance of having a financial planning system that can adapt to change. Every taxpayer should consider working with a tax professional. At WT Wealth Management, we work closely with our sister company, WT Tax Accounting, to ensure that clients have access to quality, cost-effective tax advice, which is important, given the conditions described below. The tax reform measure will significantly affect investment portfolios, which calls for a sound financial planning strategy based on fundamental financial planning principles. While taxes on business will change the most, individual taxes will be reduced as well, and will return to last year's tax levels in eight years unless further congressional action is taken. Given these temporarily reduced rates and their future uncertainty, Roth account contributions are recommended, and it would behoove investors to consult with their tax advisors on further recommendations. Tax reductions may also assist people in increasing their retirement savings to 15% or more of their present income (including employer 401(k) matches), which WT Wealth Management generally suggests. The tax reform most significant measure is a large decrease in tax rates for corporations and closely held businesses, which will enable business owners and corporate shareholders to retain more profits. While these effects will vary according to company and business sector, business owners and equity holders throughout the nation should benefit from them. 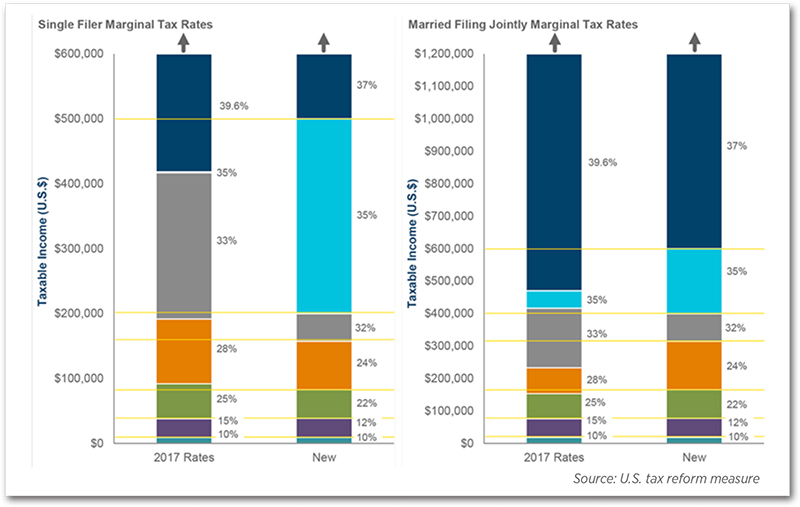 Marginal tax rates for individuals in most tax brackets will drop (Fig. 1) over the next eight years, and individual tax deductions will change as well: the personal exemption is eliminated, the standard deduction is raised, and particular itemized deductions are reduced or discontinued. The latter will include a capping of state and local tax (including property tax) deductibility at $10,000. All of these tax-code changes will likely motivate many taxpayers to employ the standard deduction in lieu of itemization. The yellow lines in the above diagram stand for new tax-bracket boundaries. For single filers, they are: $9,525; $38,700; $82,500; $157,500, $200,000, and $500,000. For married couples filing jointly, they are: $19,050, $77,400; $165,000, $315,000; $400,000 and $600,000. The 2016 presidential election and the ensuing tax reform demonstrate many things: the volatility of tax laws, the uncertainty of the political landscape, and even the uncertainty of the new measure itself. Many of its provisions for individuals expire after 2025, thus needing approved extensions from Congress and the future President; otherwise, today's tax-rate reductions could become tomorrow's tax increases. Investors can reduce the effects of tax-code changes on retirement savings through portfolio diversification. This could include holding assets in accounts with tax structures that differ from one to the next, ranging from taxable accounts to pretax savings accounts to Roth accounts with tax-free or reduced-tax withdrawals. If investors anticipate higher tax rates when withdrawing from portfolio accounts at retirement, Roth accounts are preferable to pretax ones, as buffers against higher post-retirement taxes in general. However, for investors in higher-income brackets who expect much lower income in their retirement years, hence lower tax rates, pretax contributions may still be the better option. If investors pay lower taxes in 2019, they may be left with more money to save for retirement, which means they could increase their savings to 15% or more of their present income, including employer 401(k) matching contributions, which WT Wealth Management generally recommends. Also, lower tax revenues will crimp the federal budget in unpredictable ways, particularly pertaining to Social Security, Medicare and other benefits. Yet the possibility of reduction of these benefits sends a signal to savers to take more control of their own fiscal futures, so they can depend less on a Social Security system with an uncertain fate. One can rarely forecast the long-term effect of tax reform on investment markets. Therefore, long-term strategic investment with diversified assets chosen according to the investor's individual investment time frame and risk tolerance is necessary. Even so, such a long-term strategy must be adjusted periodically; e.g., recent equity market gains may have caused drifting of asset allocations, leaving the investor with higher equity exposure than originally planned. The rebalancing of one's investment portfolio is a time-proven way to manage such risk, so WT Wealth Management monitors it closely and uses it often. The new tax measure will let some business owners who report net business revenue on tax returns to deduct 20% of that "pass-through" income from their taxes. This provision's rules will be complex, and the deductibility begins to diminish at $315,000 of one's income for a married couple filing a joint return. Yet, taxpayers who have considered starting their own businesses could see improvement in their financial prospects as a result of the lower effective tax rate. This new rate may also affect business owners' retirement investment strategies. The tax rates they are now subject to could be lower than those they would need to contend with when withdrawing post-retirement distributions, as they would be taxed as ordinary income. Small business owners should ensure their company (or solo) 401(k) plans contain Roth options. The new tax code enables state-backed college savings plans (529 plans) to allow tax-free withdrawals of up to $10,000 per year per child to pay for tuition at qualified elementary and secondary schools. Before, 529-plan assets could be harnessed in this way without penalty for higher education costs only, so the new provisions give additional incentives to save money for education through 529 plans. If their states grant tax deductions for 529 contributions and the individuals haven't yet capitalized on this privilege, investors may wish to create or expand 529 accounts prior to the state's deadline. Yet investors must consider their time frames when choosing investment strategies, especially if they wish to withdraw funds before college. The new code limits the deductibility of interest on new mortgages to the initial $750,000 of the loan principal and eliminates deductions for home equity loan interest. This, coupled with the new $10,000 limit on state and local tax deductions, including property taxes, could affect household budget and housing decisions. Obamacare's individual health insurance mandate, hence the penalty for not purchasing insurance, will be discontinued starting in 2019. But lack of coverage has major risks. The new tax measure doubles the estate tax exemption, reducing the number of estates subject to the tax even more than in 2017. Therefore, it would behoove taxpayers to review their estate plans when the changes take effect. A Roth conversion can no longer be re-characterized. Previously, if investors shifted assets from a pretax account to a Roth account, they could reverse that conversion before filing their tax returns. However, if a Roth conversion remains the best option for taxpayers, this tax-code change should not discourage them from doing so, particularly if they anticipate that their greatest tax rate will decline this year. The new code raises the income threshold for the alternative minimum tax (AMT), so the AMT should affect fewer people. Planning for it can be challenging, so taxpayers who believe they may still be subject to it after the tax reform takes effect should see their tax advisors. The congressional tax reform measure is very complicated, and its long-term effects on investors remain uncertain. 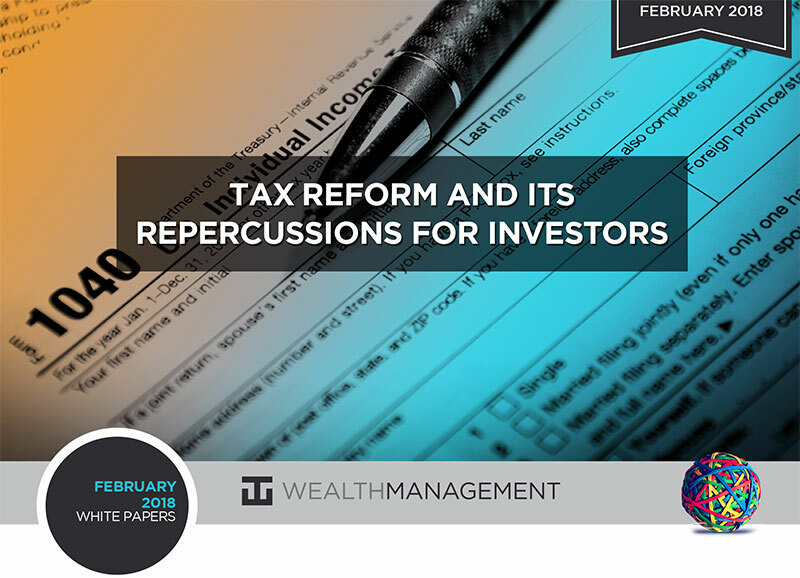 Yet taxes are but one of many considerations for investment decision-making, so consultation with one's tax advisor about how the new code will affect their particular portfolio is strongly encouraged. However, investors will clearly benefit from the reforms with savings rate increases, portfolio rebalancing, and re-comparison of the advantages of Roth over pretax savings accounts, or vice versa. A well-structured strategy of saving and investing, coupled with investment and tax diversification in one's portfolio, can help investors reach their goals, even in unpredictable times. To this end, WT Wealth Management works closely with our sister company, WT Tax Accounting, to ensure quality tax preparation for our clients at a reasonable cost. This material has been prepared by WT Wealth Management for general and educational purposes only. This material does not provide fiduciary recommendations concerning investments or investment management. WT Wealth Management and its associates do not provide legal or tax advice. Any tax-related discussion contained in this material is not intended or written to be used, and cannot be used, for the purpose of avoiding any tax penalties. Please consult your independent legal counsel and/or professional tax advisor regarding any legal or tax issues raised in this material. Ward, Judith, Roger Young, and Stuart Ritter. "Financial Planning Implications of the U.S. Tax Reform Measure." T. Rowe Price, December 20, 2017. WT Wealth Management is a manager of Separately Managed Accounts (SMA). Past performance is no indication of future performance. With SMA's, performance can vary widely from investor to investor as each portfolio is individually constructed and allocation weightings are determined based on economic and market conditions the day the funds are invested. In a SMA you own individual ETFs and as managers we have the freedom and flexibility to tailor the portfolio to address your personal risk tolerance and investment objectives - thus making your account "separate" and distinct from all others we potentially managed. An investment in the strategy is not insured or guaranteed by the Federal Deposit Insurance Corporation or any other government agency. Any opinions expressed are the opinions of WT Wealth Management and its associates only. Information is neither an offer to buy or sell securities nor should it be interpreted as personal financial advice. You should always seek out the advice of a qualified investment professional before deciding to invest. Investing in stocks, bonds, mutual funds and ETFs carry certain specific risks and part or all of your account value can be lost. In addition to the normal risks associated with investing, narrowly focused investments, investments in smaller companies, sector ETF's and investments in single countries typically exhibit higher volatility. International, Emerging Market and Frontier Market ETFs investments may involve risk of capital loss from unfavorable fluctuations in currency values, from differences in generally accepted accounting principles or from economic or political instability that other nation's experience. Emerging markets involve heightened risks related to the same factors as well as increased volatility and lower trading volume. Bonds, bond funds and bond ETFs will decrease in value as interest rates rise. A portion of a municipal bond fund's income may be subject to federal or state income taxes or the alternative minimum tax. Capital gains (short and long-term), if any, are subject to capital gains tax. Diversification and asset allocation may not protect against market risk or a loss in your investment. WT Wealth Management is a registered investment adviser in Arizona, California, Nevada, New York and Washington with offices in Scottsdale, AZ Jackson, WY and Las Vegas, NV. WT Wealth Management may only transact business in those states in which it is registered, or qualifies for an exemption or exclusion from registration requirements. Individualized responses to persons that involve either the effecting of transaction in securities, or the rendering of personalized investment advice for compensation, will not be made without registration or exemption. WT Wealth Managements web site is limited to the dissemination of general information pertaining to its advisory services, together with access to additional investment-related information, publications, and links. Accordingly, the publication of WT Wealth Management web site on the Internet should not be construed by any consumer and/or prospective client as WT Wealth Management solicitation to effect, or attempt to effect transactions in securities, or the rendering of personalized investment advice for compensation, over the Internet. Any subsequent, direct communication by WT Wealth Management with a prospective client shall be conducted by a representative that is either registered or qualifies for an exemption or exclusion from registration in the state where the prospective client resides. For information pertaining to the registration status of WT Wealth Management, please contact the state securities regulators for those states in which WT Wealth Management maintains a registration filing. A copy of WT Wealth Management's current written disclosure statement discussing WT Wealth Management's business operations, services, and fees is available at the SEC's investment adviser public information website - www.adviserinfo.sec.gov or from WT Wealth Management upon written request. WT Wealth Management does not make any representations or warranties as to the accuracy, timeliness, suitability, completeness, or relevance of any information prepared by any unaffiliated third party, whether linked to WT Wealth Management's web site or incorporated herein, and takes no responsibility therefor. All such information is provided solely for convenience purposes only and all users thereof should be guided accordingly.